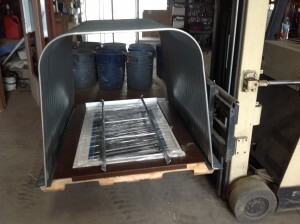 Our patented egress window system just got more affordable with DIY installation. We believe everyone deserves to have a brighter basementWe’ll tell you how. We’ll share our trade secrets for a professional installation at a DIY cost. 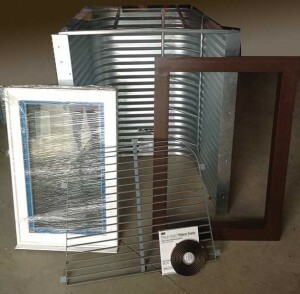 Exo-Frame DIY Egress Window Kit *grates & covers shown are an additional charge. Save Money. Save time. Order direct and save BIG on installation. Are you a builder/contractor? Or a homeowner with a serious DIY attitude? With our product you can install the best egress window on the market today—yourself! Don’t put it off. Order your Exo-Frame system now. Become the next person on your block to brag about your DIY Exo-Frame egress window. The patented exo-frame system is the best, and one of the fastest and easiest ways to install. In most cases, after the concrete is cut and the work area is prepped, installation of the exo-frame egress window system takes less than an hour. St Paul Corrugated Window Well, 18 Gauge, 30 year warranty, 50″ wide x 36″ projection x 60″ window well with ten (10) fasteners. European tilt and turn casement window (Rehau 4500 series vinyl extrusion and Roto or Hoppe hardware for superior quality). Multiple sizes available, lifetime warranty with 10 years of labor included. Patented painted Exo-Frame system with (4) pre-expanded fasteners and 3m butyl gasket (for superior seal). *DIY kits are available for pick up by appointment only.